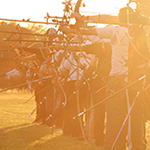 The entry form is available for this years East Midlands Archery Society, Regional Senior & Junior Outdoor Championships 2019, hosted by Wellingborough Open Archery Club. This tournament will be added to the 2018/2019 Chris Mason Celebration League. It isn’t very often that a Northants club gets the chance to host an EMAS target tournament. It would be great to see as many archers from the county attending the event as possible. Entry forms are now available for all three NCAS Caswell Series shoots. All three shoots are of course a part of the 2018/2019 Chris Mason Celebration League. Following the five indoor NCAS coaching sessions there will be one outdoor event on Sunday 26th May. The venue is WOAC field at Old Grammarians sports complex, Sywell Road, Wellingborough – NN8 6BS. The format will be much the same as the indoor sessions but with emphasis on tuning and technique to reach the outdoor distances. The morning session, from 10.00.am to 12.30.pm will be for junior archers and any parents who wish to join them. The afternoon session is from 1.00.pm until about 4.00.pm. and is for adult archers. The cost is £5.00. If you wish a place on this session please contact John Marshall. A reminder that on 29th June 2019, Northamptonshire County Archery Society are putting on a charity Dawn til Dusk shoot. We’ve had a great initial response to this, with donations already being made, and lots of archers wishing to take part on the day. Please remind the other members of your club about the event. The shoot will be kindly hosted by Wellingborough Open Archery Club at The Old Grammarian’s Memorial Sports Field. The event will be a “Dawn ’til Dusk” shoot starting at 05:30 and running through to 21:00. The archers involved will raise money through sponsorship by shooting sessions throughout the day. There will be 5 sessions shot throughout the day. Sessions 1 – 4 will be National Rounds (6 dozen arrows over 2 distances) and Session 5 will be a Warwick Round (4 dozen arrows over 2 distances). 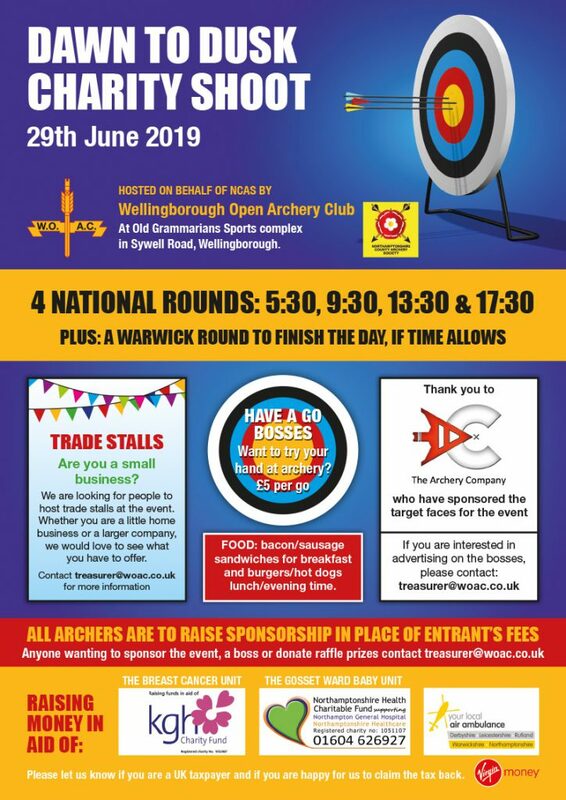 Our aim is to have as many archers from within the county as possible to take part and contribute to this event, to help us achieve our target for the 3 chosen charities. Please see the link below for more information and online donations to the charity shoot. The link is also what you will need to forward to your sponsors to allow them to donate electronically. Your sponsors will be given the option of leaving a message and can add that it is on your behalf there if they wish to. Why a target of £12,000? When contacting the charities to ask if we could fundraise for them Northampton General Hospital advised that they wished to raise funding for a special cot for babies with respiratory problems and that these cots cost £2,000 each – why fund one if we can fund two? This helped us to set the target at £12,000 because £4,000 for each charity would see 2 cots for the unit. When looking at what this might mean for the other chosen charities we were surprised to read that our local air ambulance service averages 6 rescue missions per day and each mission costs approximately £1,700 so we might help keep that air ambulance in the air for half a day with £4,000. We are grateful for all donations that we receive, but don’t let the target affect your decision. If we are fortunate to be in a position where the target is reached we would still like you to donate as much as you can afford so that all 3 charities receive as much support as we can give them. Once the event has been completed and we have all funds in, Helen will update the page to include the offline donations to allow us all to see the grand total raised. For anyone who took part in the Remembering Chris Mason Dawn til Dusk shoot back in 2015, this was a truly fantastic day. Hopefully this event will be just as enjoyable and succesful. Download a PDF version of the event flyer. The entry form is available for Wellingborough OAC’s Outdoor Open, on Sunday 12th May 2019. Rounds: St George, Albion & Windsors. Venue: Old Grammarians Memorial Sports Field, Sywell Road, Wellingborough, NN8 6BS. This shoot is part of the 2018/19 Chris Mason Celebration League.